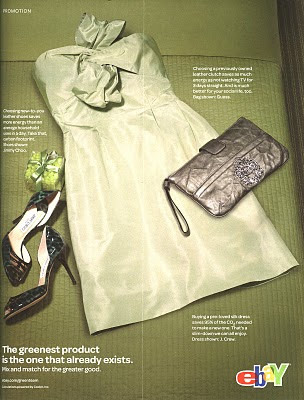 EBay's newest ad campaign (as seen in the April 2010 issue of Marie Claire magazine) promotes buying and using vintage as the ultimate "green" purchasing activity" "The greenest product is the one that already exists." Most thrifty shoppers and vintage living folks know this, but it's great to see eBay promoting it. Near the end of the magazine, promotion of the Recycle For Rewards program, a rewards and loyalty program that motivates people to recycle and to engage in environmentally virtuous activities with points redeemable for shopping, magazine subscriptions, etc. 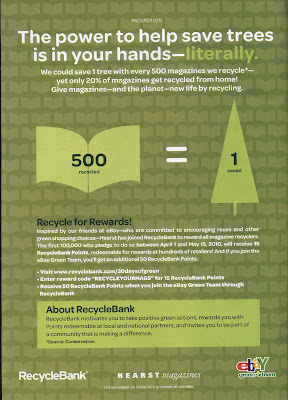 The first 100,000 who pledge to recycle their magazines between April 1 and May 15, 2010, will get 15 RecycleBank Points using reward code "RECYCLEYOURMAGS." And if you sign up for the eBay Green Team, you'll get another 50 points (currently, it's a box to toggle when you register at RecycleBank).